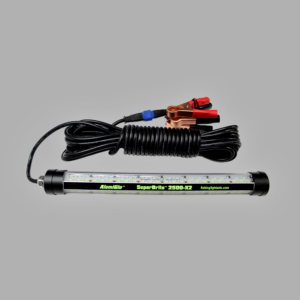 AlumiGlo LED ice fishing lights freeze the competition. 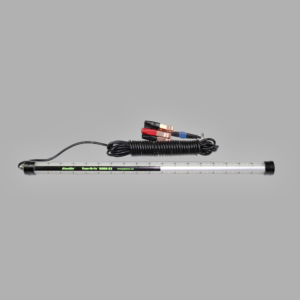 To get the most out of your next ice fishing trip, bring along one of our SuperBrite LED ice fishing lights, which are durable enough to withstand even the coldest weather without cracking or breaking thanks to their all-aluminum construction. 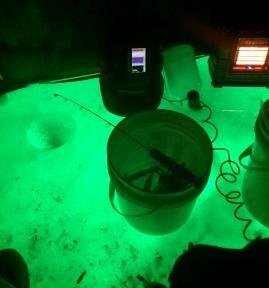 By suspending our white and/or green ice fishing lights directly under the ice (preferably in a separate hole from your fishing hole), the 360 degree light beams will soon begin attracting microscopic plankton toward the surface, which will in turn attract the fish that consume those plankton. 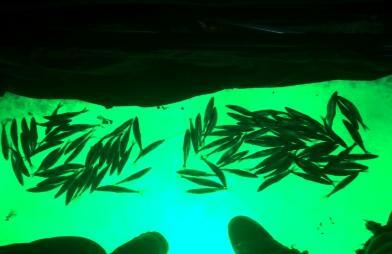 Our lights have been proven to be effective at attracting many different species of fish, and are a favorite of ice anglers in northern states like Michigan and Maine when smelt fishing. If space is tight in your ice shanty, you’ll be very pleased with the small and compact size of our SuperBrite 2500-X2 and SuperBrite 8000-X2, which are 12” and 24” long respectively.